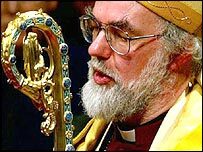 BBC NEWS | UK | Magazine | Could an agnostic be bishop? Could an agnostic be bishop? 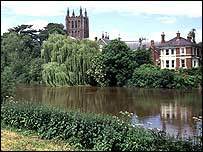 The Bishop of Hereford's job falls vacant today while tomorrow new laws come into force banning religious discrimination in the workplace. So could I, an agnostic, be a contender? The perks are more extravagant than the modest £33,000 salary, but together they make a tidy package. When Rev John Oliver stepped down from his job as Bishop of Hereford on Sunday, he also gave up rights to a chauffeur, an 18th-Century rent-free dwelling, a gardener and a splendid workplace set on the banks of the River Wye, namely Hereford Cathedral. For the moment at least the vacancy for one of the top jobs in the Church of England remains open. As luck would have it, at the same time new employment regulations come into force which forbid discrimination in the workplace on the grounds of religious belief. So should I, an agnostic, put in an application? The vacancy, after all, has already been the subject of the Church's efforts to portray a more open, inclusive image. It is the first bishop's job to be advertised in the C of E's 470-year history. I freely admit that I lack one or two of the more important qualifications: a firm belief in God for example. But I can confidently clear one of the most fundamental hurdles - I'm male. Women remain barred from the most senior proselytising posts in the Church. New regulations or no new regulations, the unsurprising truth is I'm never going to be a contender. I was never even baptised. "No one could stop you from putting your name forward but clearly you don't fit the requirement of having been ordained... for 10 years," says Arun Kataria, a spokesman for the Church. But the point raises an important question. With the playing field levelled between followers and non-believers, what right would the Church have to refuse job applications from atheists? The bad news for secularists harbouring ambitions of a Fifth Column assault on the Church is that a clause has been written in that allows faith-based employers to treat their staff differently. The clause has provoked fierce debate. Secularists say it is an open invitation for the likes of church schools to flush out teachers who are non-believers. The Church, meanwhile, says the wording of the exemption is too vague. The same argument is made about new rules outlawing discrimination against gays in the workplace - an issue being hotly debated by the Church of England - which come into force today. Under the new regulations, the Church has the right to treat people differently if there is a "genuine occupational requirement" that a certain post must be filled by a follower of the faith. There's no doubt that a vicar's job would fall into this exemption, as would that of a curate's. But it's other roles, such as administrative and support jobs, that are in question. A document distributed by Lambeth Palace outlines how parishes need to make the link between such roles and religious belief, if they are to avoid a slew of writs. So, in the case of a youth worker employed by the Church, the purpose of the job must be to relate "to relate the Christian faith... to young people both in and outside of the church". What sort of posts might the Church employ non-believers to? There is no ranking of jobs, says Mr Kataria. "It's difficult to be very specific because posts vary so much. Especially at local level people cover more than one responsibility in their role. "In terms of office-based jobs, the requirement for employing an Anglican would be far less necessary." It's not just churches that are in the frame. Faith-based schools and care homes, welfare charities, even the YMCA, qualify as having a religious character and could use the new rules to filter out atheist applicants or those from a different faith. Keith Porteous Wood, of the National Secular Society, says the net has been cast too wide. Groups have been jumping on the "Christian bandwagon" so they can, in future, be sure of excluding non-Christians and gays. "There seems to be no bar on who is considered a religious employer," he says. The YMCA, for one, has rejected accusations that it will use the new rules to shut out new applicants and dismiss staff who don't fit a "Christian" profile. As for the vacancy at Hereford Cathedral, a spokeswoman for the diocese says they are awaiting an announcement for John Oliver's replacement.